That’s why, on the center of the ECB’s homepage, there’s a series of last week’s rates – and this relic – an interactive Inflation Game (I kid you not) where in 22 different languages you can play the game of what happens when inflation goes up and down. If you’re feeling more adventurous, there’s also a game called Economia, where you can make up unemployment rates, growth rates and interest rates and see what happens. What you can’t do is see what happens if you bet trillions of dollars against various countries to see how much you can break them, before the ECB, IMF, or Fed (yes, it’ll happen) swoops in to provide “emergency” loans in return for cuts to pension funds, social programs, and national ownership of public assets. You also can’t input real world scenarios, where monetary policy doesn’t mean a thing in the face of tidal waves of derivatives’ flow. You can’t gauge say, what happens if Goldman Sachs bets $20 billion in leveraged credit default swaps against Greece, and offsets them (partially) with JPM Chase which bets $20 billion, and offsets that with Bank of America, and then MF Global (oops) and then…..you see where I’m going with this. We’re doomed if even their board games don’t come close to mimicking the real situation in Europe, or in the US, yet they supply funds to banks torpedoing local populations with impunity. These central entities also don’t bother to examine (or notice) the intermingled effect of leveraged derivatives and debt transactions per country; which is why no amount of funding from the ECB, or any other body, will be able to stay ahead of the hot money racing in and out of various countries. It’s not about inflation – it’s about the speed, leverage, and daring of capital flow, that has its own power to select winners and losers. It’s not the ‘inherent’ weakness of national economies that a few years ago were doing fine, that’s hurting the euro. It’s the external bets on their success, failure, or economic capitulation running the show. Similarly, the US economy was doing much better before banks starting leveraging the hell out of our subprime market through a series of toxic, fraudulent, assets. The paper is full of mathematical formulas and statistical jargon, which may be why the media didn’t pick up on it, but hey, I got a couple of degrees in Mathematics and Statistics, so I went all out. And it’s fascinating stuff. WHAT AN INCREDIBLE WHIRLWIND OF CRISIS from seven foul winds around the globe. Most emanate from Europe, which is far from its climax in crisis. Three steps will lead to full blown eruption, the first Italy with rising bond yields and a bank run, the second Spain with rising bond yields and admission that banks are far more insolvent than recognized, and third the failure of all three largest French banks as the principal swine creditor. In fact, a great split has occurred, as France has been cut off from the future world by Germany, which looks East to Russia and China. The Berlin leaders will not be needing French squires to carry their bags, but instead will watch as Paris becomes the appointed leader of the PIIGS. As the most exposed banks to Southern European sovereign debt, pig slop of immeasurable weight is tied around the laced Parisian necks. The common link across the Atlantic pond is derivative corruption. The Europeans are doing their best to force feed a convenient but cockeyed definition of a debt default event. The Americans resort to old fashioned theft, calling it missing funds, blaming the crisis, while breaching the sacred segregated client fund directive. The crisis struck the US shores with the hidden JPMorgan chamber implosion and urgently needed theft, whose visible face is the MF Global heist and failure. My belief is that JPMorgan used its MFG patsy to anchor derivative trades, that just happened to be long sovereign debt in Europe. Nobody in his right mind, even a Corzine of GSax pedigree would place such large wrong trades unless obligated as a syndicate cog in the machinery. The big US banks will sit on the bankruptcy boards and decide the fate of victim accounts without client representation in a full scale insider exercise that makes a mockery of justice. That has been the American norm. Witness the middle stage of the collapse of the COMEX, which has lost all trust as segregated client cash accounts vanished in a vast ongoing commingling campaign. One must conclude that JPMorgan must have really needed the money. The thought of a Madoff Redux comes to mind to the alert but weary. The MF Global vanished funds will eventually be measured over $3 billion. The actual Madoff pilfered funds totaled $150 billion, triple the more palatable figure often quoted. The locations of the missing funds have commonality, the ruling untouchable syndicate. 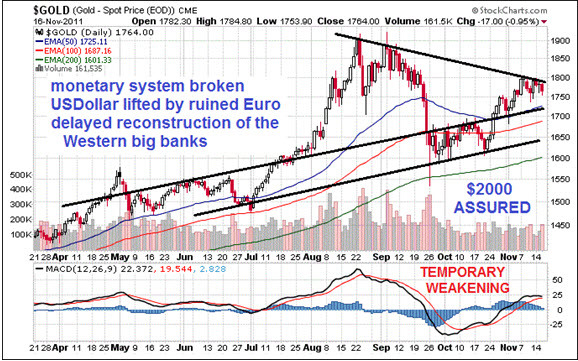 Gold smells the destruction of the monetary and banking systems, aggravated by Western recession. Gold smells new application of debt to repair old failed debt structures, where central bankers chase their tails. Gold smells the vast reconstruction project for the giant Western banks, not too big to die of internal rot, only too big to let fail by a gavel. The twisted bizarre attempt to control commodity prices by presiding over a series of negligent policies is coming to an end. The Western recession is too much for the insolvent banks to bear. The US banks have real estate debt rot, but the European banks have both real estate debt rot and PIIGS debt rot. In truth, the US banks share great risk from across the pond. The thrust of the French-based central bank over the pen of swine cannot be far from a formal announcement. Not quite what the highbrow French had in mind for leadership. Better to rule in clubmed pig slop than serve as lackey in the teutonic core. The death of the monetary system has its main motive in the refusal of governments either to manage finances responsibly or to repay debt in the usual manner. They accumulate larger debts and plan the swindle of inflation in return. Their only viable approach, hardly a solution, is to inflate debt and thus to reduce its burden. Creditors feel betrayed, seek defensive measures, like to cut off credit and loan up quietly on gold, while lying about reserves. The creditors are not involved in the important decisions to debase the currency. Those decisions are made unilaterally by the debtors. A run on the US Treasury Bonds is occurring by angry foreign creditors. The USDollar is kept afloat by some secret corners. The pages of history are littered with examples of government debt default, but more often with the public paying for debt reduction in basic price inflation. The debts accumulated by many governments large and small cannot be repaid. History shows that tangible assets like Gold & Silver protect from the worst economic consequences. For the current financial crisis, only one pathway seems likely, although painful. The system cannot be remedied, only patched over. Vast inflation is the only politically viable method of repudiating these unmanageable obligations. Of key importance is the velocity of money in determining whether or not inflation turns into hyper-inflation, which requires final demand not to falter badly. Hyper-inflation requires sustained activity like an engine, which cannot stall. Higher price inflation is coming like night follows day, but probably not an extreme case. It will be painful though, since the cost structure will be the primary damage center. The US Consumer Price Inflation runs at 11.1% in the honest broker Shadow Govt Statistics calculation, which is painful enough. The retreat is well along, the isolation to the hyper inflation machinery well along, the sovereign bond ruin well along. The Fed was hit with withdrawals of $83.3 billion on November 2nd, the largest withdrawals coming from its deposit accounts. This single day removal was the largest since February 2009, and not associated with quarterly tax payments. The withdrawals are being demanded by countries angered by USGovt policies, like China, Russia, Latin American, and other Asian players. It is only the beginning of a bloodletting. A run on USTBonds is in progress, covered up by Quantitative Easing and Operation Twist, programs given innocuous names but integral to the grand debasement process underway. The bond exodus is complemented nicely to significant removal of depository funds from the major banks in the ‘Move Your Money’ movement. Despite pleading by the big US banks for customers not to extract their money, impressively 650 thousand customers moved a total $4.5 billion dollars out of the big banks. The damage done is 10x to 20x, due to fractional banking practices. The funds went into smaller banks and credit unions in October. The recipient of the alleged transfer would be the most insolvent of global hedge funds, the European Central Bank. One must suspect that no pledge was made, and a trial balloon was floated. It was promptly shot down. Germany has lost its appetite to make huge annual donations to support an unjustified standard of living for Southern Europe, which grossly lacks industry, a strong work ethic, and ability to collect taxes. Those nations abused the low Germanic interest rate, built housing bubbles, perpetuated young pension benefits, permit tax evasion, and face ruin. Germany will no longer sacrifice Euros at the foot of any PIIGS altar, plainly stated. Conclude that the EuroZone, the Euro Central Bank, and the European Financial Stability Facility are all dead broke and insolvent, and worse, have zero credibility in the capital markets. The real ugly controversy comes soon when collateral placed in return for grandiose aid will be lost, including some central bank gold bullion. The European Commission has no voice either, having pandered to the bankers. The CME has advised that 1.42 million ounces of registered COMEX silver inventory is unavailable for delivery due to MF Global bankruptcy, as well as 16,645 registered ounces of gold also unavailable for delivery. That is a lot of bullion in breach of contract. The lawyers will be lined up very quickly to carve the metals exchanges into pieces. The COMEX is totally broken, unable to honor basic contracts, unable to deliver from committed legal contracts, unable to even protect client funds from commingling grabs. But during a period when investors cannot protect themselves, an ambush could easily come in the next week to push down the Gold price in the usual manner, via naked shorting. As the grandiose destinations become clear for vast new monetary creation, the Gold & Silver prices will run higher. The big immediate questions center on how much dithering the banker elite that run our governments will permit with malignant motive before the decisions are made, and how much economic deterioration will be permitted to contain commodity prices before the decisions are made. The destinations are bank bailouts for toxic sovereign bonds, recapitalization of the big Western banks, coverage of new USGovt debt, and economic stimulus. A few $trillion will be needed, as estimates by well-informed veterans mount like a stack of white papers. The economic damage is being done, even though the crude oil price has finally zipped above the $100 mark. Ironically, as the orchestrated Libyan liberation war finished, the crude oil price has moved from $77 in early October to $102 today. Demand is not coming from economic growth, but from hedging against the ruined major currencies, all of them. Global QE is alive! With the gold market in turmoil from grand Asian raids, from absent COMEX inventory, from snatches of GLD inventory, from pilfered COMEX fringe accounts, from continued naked shorting, the safer bet with quicker payoff has been crude oil hedges. But Gold will have its day, and Silver will scoot through the opened phalanx as usual. The delay in reckoning is laden with frustration, but the day of $2000 is coming. It is something the bankers cannot stop. They are so busy kicking cans down the road, they do not see the Rotweillers and Dobermans sniffing their trails. The biggest and most important danger signal for complete eruption of the Eropean financial crisis is the Italian sovereign bond. Their yield surpassed the 7% mark to sound great alarms, completing a Jackass forecast over the last several months. This level is the recognized crisis signal, the call to arms, the call to remove deposits, the call to demand collateralized loans. Their sovereign bond yield has zoomed upward in response to higher margin requirements. Italy is the next Greece, which was a crisis prelude. Italy scares the American and European central bankers witless. The Italian Govt Bond yield remained for 40 days above the 5% mark before it hit 6% two weeks ago. Its rise has accelerated, as the panic widens. The Italian yield suddenly surged past 7% with haste last week, reaching 7.5%, setting off shrill alarms. The Italian leadership is in question, its Prime Minister to be a victim. The 10-year yield went below 7% only because of heavy emergency buying by the Euro Central Bank, against their stated wishes. The Italian banks are far weaker than they reveal. The next PIIGS domino is soon to fall, for certain to take down Spanish Govt Bonds also. The new head of the EuroCB, the resplendent GSax pedigreed Mario Draghi, must cover the debt or watch the European Monetary Union crumble in a sea of fire. The central bank must make overt commitments of magnitude. If the crumble happens upon inaction, expect 20 Lehman events with numerous bank failures, starting with France. The conflagration would extend to London and New York. The market is stating that Italian Govt repayment of rollover debt is in crisis mode, highly unlikely. Italy must roll over more than EUR 360 billion (=US$490 bn) of debt before end 2012. The borrowing costs for Italy have become highly burdensome, if not crippling and destructive. The debt rollover in upcoming auctions stands as the immediate event to watch. Lenders do not wish to hand money to Italy for servicing past debt interest, good money after bad. Even if budget reforms succeed, the austerity measures will constitute more poison pills that assure a faster economic recession from cut projects, more unemployment, and hostile response by the public, like worker strikes. Recall Jackass comments made a year ago. The prevailing opinion was that Italy had favorable debt ratios, like cumulative debt to GDP, like annual deficit to total budget. My objection was that ratios mattered little, when the required debt volume to finance was too large in a crisis filled bond market. My forecast was for Italy to erupt along with Spain eventually. That viewpoint has turned out to be correct. Barclays has declared that Italy is finished kaput. The next Greek ruin on the plaza square is happening in Rome. The bond market is rejecting Italy loudly. Italy has dragged its feet for two months, rejecting warnings, refusing budget cuts, while its prime minister has given defiant messages loaded with denial. He even accused financial journalists of causing a run on their bonds. Time has run out on Italy. Watch for France to catch the viral contagion, being a major creditor. The Euro Central Bank is the only buyer of Italian Govt Bonds. They are the focus for action. When Italy erupts, it will spread to Spain first, and then quickly to France as its primary creditor. The nation of Spain is not in the news much at all, but it will be next year, just like Italy with the same type of problems, but compounded by a bigger housing bust. The research staff at Barclays in London has declared that Italy is formally finished and cooked, as they put it “Italy is now mathematically beyond the point of no return.” The Greek tragedy has finally struck Italy. Expect violence on the streets of Rome and other cities, an Italian tradition where innocuous brands of communism have splintered roots. An invisible bank run is occurring in Italy. Their banks are trapped, attempting to de-leverage on a perilous tightrope forced by tightened bank reserve requirements. They have developed a big dependence on Euro Central Bank funds. The Credit Default Swap market indicates an expected Italian default. Next the bank deposits will exit. Italian banks have grown overly dependent on the European Central Bank. They borrowed EUR 111.3 billion (=US$152 bn) from the central bank at the end of October, up from EUR 104.7 billion in September and a smaller EUR 41.3 billion in June, as per Bank of Italy data. The five biggest lenders accounted for 61% of the country’s draw on ECB funds in September, double that of January. The banks include UniCredit, Intesa Sanpaolo, Banca Monte dei Paschi di Siena, Banco Popolare, and UBI Banca. These distressed banks must reduce their debt load in a highly dangerous bond environment marred by distrust and volatility. The decline in Italian Govt Bonds has rendered great damage to the private banks, reducing their reserve ratios and eroding loan collateral devoted to support regular business credit. The Italian banks are trapped in the Italian sovereign debt securities. The austerity plans being forced will ensure a recession, thus even more losses for the banks. The run on Italian banks is just beginning, to become more visible in a couple months. The bond market expects some calamities. The debt insurance for individual banks demonstrates the extreme level of distress. European private banks are dumping sovereign bonds, hampering the already strained market. They are forced to comply with tougher newly enforced BIS reserves requirements. They are fighting to survive, but exposing the sovereign bonds as junk, and worse, dragged down by old real estate debts just like in the United States. The entire system is collapsing without potential remedy unless all major banks are liquidated, and that will never happen. They house the political power center, and the bond fraud laboratories. At the heart of the vulnerability is the fractional banking system itself. Insolvency arrives quickly and only worsens until a run occurs. Then comes rampant bank failures. THE EUROPEAN BANKING SYSTEM IS TOPPLING. IT CANNOT BE STOPPED. GREAT CONTROVERSY WILL RESULT. MOST LARGE BANKS ARE POSTING HUGE LOSSES FROM GREEK EXPOSURE. THE NEXT ROUND OF LOSSES FROM THE OTHER P.I.I.G.S. NATIONS WILL BE AN ORDER OF MAGNITUDE LARGER. THE EXTREME BREAKDOWN WILL OCCUR WHEN THE BIG FRENCH BANKS GO BUST. Even Citigroup chief economist Willem Buiter recognizes the extreme risk and dire nature of the situation in Europe. He said, “I think we have maybe a few months, it could be weeks, it could be days, before there is a material risk of a fundamentally unnecessary default by a country like Spain or Italy, which would be a financial catastrophe dragging the European banking system and North America with it. So [the central banks] they have to act now.” Look for enormous Dollar Swap Facility usage for covering PIIGS bonds, in particular from Italy and Spain. The French Govt Bonds will be next under attack, like in January. Their yields remain low, but they are rising, and the Bund spread is widening. My guess is that the swap facility is already being tapped in heavy volume, on days the Euro currency rises especially. France introduced budget austerity, a surefire time bomb for the big banks that teeter in Paris. Nothing was learned from Greece, where recession is accelerating from the poison pills. The French banks bear the largest load for Italian Govt debt, more than double the German load and almost half the entire European load. France is tied with the lethal umbilical cord from Italy. The Dexia exposure to Greece and Italy has been detailed. German banks are not immune from big losses, nor immune from the financial crisis. Commerzbank suffered a big loss, typical of the German banking sector. With all the attention last month given to the big French banks, the weak links inside the German banking system are only recently coming to light. They are less but still sizeable. US banks are deeply exposed to European Govt debt default insurance. The risk is not offloaded, but rather shared and joined. The risks are rising astronomically for American banks, while large commitments are made, and partnerships are formed. The US press blithely reports a condition of near immunity of US banks from the financial crisis separated by an ocean. Great controversy lurks on insured debt. If the regional recession does not pull France down, its banks will. They will succumb to horrendous Italian exposure. 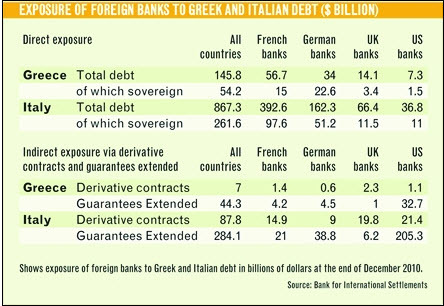 Notice the French banks have three times as much debt with Italian companies, versus Italian Govt debt. As the Italian Economy slides rapidly into recession, a considerable portion of the nearly $400 billion in total debt exposure will go rotten. One can see that Italy is Greece times seven. German banks are also on the hook for Italian sour grapes, but less than half the total. The Spanish Govt Bond is the fuse that lights the Semex behind the French bank failures. Their bond yields surged past 6% as the contagion spreads. The bonds of Spain will endure similar pressures as Italy, deep scrutiny, and relegation to the Euro Central Bank outhouse, the major bagholder. The banking system in Spain operates on fairy tale reserves. The Spanish Economy is weighed down by 23% jobless rate. All PIIGS nations will be crushed by the crisis, no nation spared. Spain has officially entered the red zone as their sovereign bonds have been targeted. They have solved nothing, dealt with nothing, and downgraded no bank assets, preferring to live in a make believe world. While the Italian Govt Bond yield has relaxed toward levels below 7%, the Spanish Govt Bond yield has risen steadily since August from 5% to above 6% in an unrelenting march. It took five weeks to breach the 6% level, once the 5% level was breached. The Euro Central Bank is reported to be actively purchasing sovereign bond from both countries, to stem the crisis. Their efforts are futile, since private bank sales rise to supply the central bank at the window. After the official purchases, the private banks are highly reluctant to purchase anew, since that bond market has been badly tainted. The Italian & Spanish Bovt Bonds are in big trouble, but the sleepy story is how France will soon join the PIIGS as the leader in the toxic sloppy pen where monetary paper feces spews openly. Some heavy damage is being quietly done on French bonds, where the banks hold much of their own national debt and the toxic Italian debt. Some claim it is game over with Italy on the ropes. My view is that the game is almost over, as the Italian debacle has spread quickly to Spain. But the main event in the recognized implosion is the sudden failure of all three of France’s big banks. When Societe Generale, BNP Paribas, and Credit Agricole all go bust in a sudden burst wave of insolvency, illiquidity, and recorded losses to their artificially lifted balance sheets, the game is truly over. Then and only then, the great reconstruction of the European banking system will begin, complete with $3 trillion in freshly printed money. The Gold market comprehends this fact, and anticipates it fully, with patience. The MF Global corrupted chaos has put a new log in the golden road. The bank leaders have attempted to redefine debt default, as part of the bailout fund negotiations. This is the latest deeply corrupt practice, with some objection showed by the major debt rating agencies. Any loss of original debt security terms is a default, whether voluntary or blessed by the elite cartel. Expect court action and lawsuits in response. Another angle is being covered, whereby redenomination of debt in another currency is also declared not a default event. Great lengths are being taken, for a simple reason. A string of Credit Default Swap claims on debt default would expose the entire market as corrupted and under-funded by a wide margin to honor claims. With defaults, all the big banks would die in a flash. This is huge issue not addressed that invalidates an entire shadow-filled market. If sovereign bonds cannot be hedged effectively and predictably, the bond yields will rise fast from lack of demand. Watch out below for Italy. European banks will suffer losses without buffers that were expected to serve as hedges. 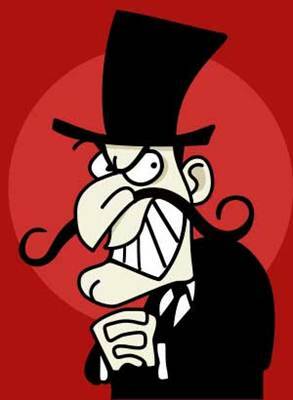 Coverage to the MF Global fraud, theft, and violation of the financial markets is full of intrigue and bold strokes. A sacred pledge has been broken against segregated accounts and their partitioned sanctity. Witness the second stage of the grand American fraud exposure. The first stage was the subprime mortgage fraud, with Lehman Brothers kill, JPMorgan assert grab and reload, followed by the TARP Fund dispersal, and the mortgage contract forgeries. The MF Global theft exposes the lack of integrity in the financial futures markets, and one step closer for the death of JPMorgan, which is plugging holes rather than permitting a COMEX default. Over a thousand gold contracts will not be delivered, a breach. Over ten thousand silver contracts will not be delivered, a breach. The final stage could feature a bank holiday and background heist of personal accounts. Some thought such forecasted warnings to be wild and reckless, but look at the pilfered futures cash accounts. Precedent has been set, warning given. Nothing is safe in the American system. Veteran traders should have known better, like Gerald Celente, whose accounts are locked up, cash and all. What a travesty and blight on the US system! Time is slim to remove money from the US system, whose banner is fraud. MF Global is a more visible and flagrant breach and desecration than the Madoff Fund fraud and theft. The total missing Madoff funds was reported to be $50 billion, when the actual total was closer to $150 billion. The MF Global missing funds are reported to be $650 million, when in reality the total is closer to $2 to $3 billion. MF Global has located $658.8 million in customer funds in a custodial account at JPMorgan Chase, which contained a total of $2.2 billion as of October 31st, including both the MFG money and customer funds, pure commingling of funds. This is a smoking gun certain to go unpunished. My belief is that JPMorgan stole the easily accessible funds placed too close to the action. Harbor doubts that CEO John Corzine will be indicted or serve prison time. The FBI is on the case. Their investigation will most likely be as effective as with Madoff, and recall they protected Goldman Sachs three years ago when a Russian man snatched the Unix software used by GSax for insider trading. It viewed incoming orders on the NYSE microseconds before the orders were executed. The FBI arrested the man, the illegal trading trail went cold, and the venerable firm continued doing God’s work. In my view, the MF Global case will render irreparable harm to the US financial system on the commodity side. Countless professional traders and their firms recognize the threat to segregated accounts and their sanctity. Trust is gone, and so is their money. No new money will enter those tables. Safeguards did not merely fail, they were abused once more in a long list of fraud events. The Commodity Futures Trading Commission has failed on the job for the public, while doing an excellent job for the syndicate in power led by JPM and GSax. The next sham charade will be the big US banks serving on the creditor committees to oversee dispersal of funds that they were not able to steal already. JPMorgan is the agent for a $1.2 billion syndicated line of credit to MFG. It was named to the committee despite also having a $300 million secured loan against the MFG brokerage unit, a position pitted against other unsecured creditors in an obvious conflict of interest. JPMorgan slapped a lien on MF Global assets in an audacious maneuver. A formal dance is in progress, where the public is amateur. Lack of cooperation has been given by MF Global so far. Witness a possible hidden derivatives meltdown, as the European implosion has a conduit to the United States. With inter-bank lending so scarce, many Wall Street banks extended heavy loans to the distressed European banks in the last couple months. The story is not told that way, only as a large financial firm failure run by an ex-Senator and ex-Governor, a fallen pillar in the financial crisis. What has happened could be a critical step toward the ruin of the COMEX itself, and its transition into a Cash & Carry operation for precious metals. The reins holding back Gold are slowly vanishing or being discarded. MOST PEOPLE HAVE NO IDEA THAT WALL STREET HAS BECOME A GIGANTIC FINANCIAL CASINO. The big Wall Street banks are making tens of billions of dollars a year in the derivatives market, and nobody in the financial community wants the party to end. The word “derivatives” sounds complicated and technical, but understanding them is really not that hard. A derivative is essentially a fancy way of saying that a bet has been made. Originally, these bets were designed to hedge risk, but today the derivatives market has mushroomed into a mountain of speculation unlike anything the world has ever seen before. Estimates of the notional value of the worldwide derivatives market go from $600 trillion all the way up to $1.5 quadrillion. Keep in mind that the GDP of the entire world is only somewhere in the neighborhood of $65 trillion. The danger to the global financial system posed by derivatives is so great that Warren Buffet once called them “financial weapons of mass destruction”. For now, the financial powers that be are trying to keep the casino rolling, but it is inevitable that at some point this entire mess is going to come crashing down. When it does, we are going to be facing a derivatives crisis that really could destroy the entire global financial system. Most people don’t talk much about derivatives because they simply do not understand them. Perhaps a couple of definitions would be helpful. The following is how a recent Bloomberg article defined derivatives…. Derivatives are financial instruments used to hedge risks or for speculation. They’re derived from stocks, bonds, loans, currencies and commodities, or linked to specific events such as changes in the weather or interest rates. The key word there is “speculation”. Today the folks down on Wall Street are speculating on just about anything that you can imagine. The following is how Investopedia defines derivatives…. A security whose price is dependent upon or derived from one or more underlying assets. The derivative itself is merely a contract between two or more parties. Its value is determined by fluctuations in the underlying asset. The most common underlying assets include stocks, bonds, commodities, currencies, interest rates and market indexes. Most derivatives are characterized by high leverage. A derivative has no underlying value of its own. A derivative is essentially a side bet. Usually these side bets are highly leveraged. At this point, making side bets has totally gotten out of control in the financial world. Side bets are being made on just about anything you can possibly imagine, and the major Wall Street banks are making a ton of money from it. This system is almost entirely unregulated and it is totally dominated by the big international banks. Over the past couple of decades, the derivatives market has multiplied in size. Everything is going to be fine as long as the system stays in balance. But once it gets out of balance we could witness a string of financial crashes that no government on earth will be able to fix. The amount of money that we are talking about is absolutely staggering. Graham Summers of Phoenix Capital Research estimates that the notional value of the global derivatives market is $1.4 quadrillion, and in an article for Seeking Alpha he tried to put that number into perspective…. If you add up the value of every stock on the planet, the entire market capitalization would be about $36 trillion. If you do the same process for bonds, you’d get a market capitalization of roughly $72 trillion. The notional value of the derivative market is roughly $1.4 QUADRILLION. • 40 times the WORLD’S STOCK MARKET. • 10 times the value of EVERY STOCK & EVERY BOND ON THE PLANET. • 23 times WORLD GDP. It is hard to fathom how much money a quadrillion is. If you started counting right now at one dollar per second, it would take 32 million years to count to one quadrillion dollars. Yes, the boys and girls down on Wall Street have gotten completely and totally out of control. In an excellent article that he did on derivatives, Webster Tarpley described the pivotal role that derivatives now play in the global financial system…. Far from being some arcane or marginal activity, financial derivatives have come to represent the principal business of the financier oligarchy in Wall Street, the City of London, Frankfurt, and other money centers. A concerted effort has been made by politicians and the news media to hide and camouflage the central role played by derivative speculation in the economic disasters of recent years. Journalists and public relations types have done everything possible to avoid even mentioning derivatives, coining phrases like “toxic assets,” “exotic instruments,” and – most notably – “troubled assets,” as in Troubled Assets Relief Program or TARP, aka the monstrous $800 billion bailout of Wall Street speculators which was enacted in October 2008 with the support of Bush, Henry Paulson, John McCain, Sarah Palin, and the Obama Democrats. SLOVAKIA HAS NOW APPROVED THE EUROPEAN DEBT-CRISIS bailout fund, but the problems Europe is experiencing are similar to those faced by America in the grip of the Fed’s immense bailouts of the past two years. Increasingly, these are seen as morally repugnant by citizens throughout the West. And this has significant consequences that the mainstream press declines to report. Dominant social themes work by omission as well as commission; in this column, I want to re-examine potential ramifications. I’ve done it before, but I think it’s worth repeating. Not enough commentators, even in the alternative media, point them out in my humble opinion. Money continues to flood Western regimes and financial institutions with billions and billions that they don’t deserve and cannot properly apply. Perhaps there is no alternative but to “kick the can down the road.” On the other hand, perhaps the bailouts are part of a wider elite destabilization effort, one intended to generate chaos and misery that will pave the way for global governance and maybe a new world currency. This is the view of the more conspiratorially-minded among the alternative media. For whatever reasons, the bailouts, against all logic, continue apace and are being increasingly resisted … not merely for their Draconian impacts but because people are using technology to become more informed. This bailout saga, therefore, has been unusual, not only for the incalculable wealth that’s been extended but also because it’s played out in front of millions. The ramifications continue to be felt in my view. The push-back began in the US with TARP and then continued with revelation of US$16 trillion-plus (probably more) in short-term loans extended by the US Federal Reserve to financial institutions – not just in America but around the world. The Internet has allowed people to see – finally – exactly what’s going on. Prior to the Internet, the controlled mainstream news would have explained in unison that the Fed “made massive adjustments to the global financial fabric to ensure that systemic collapse was mitigated …” or employed other nonsensical euphemisms. These sorts of non-explanations would have been repeated ad nauseum. But in the era of the Internet, such gobbledygook has been effectively negated by literally millions of articles (and thousands of videos) explaining what central banking really is – monetary price fixing – and how central bankers “print money from nothing” to advantage their cronies at the expense of everyone else. The system survived because it appeared so incomprehensible that it was beyond criticism. Not anymore. People around the world “get it” and the anger is breaching even the indolence of the political class. Eventually, if certain fundamental knowledge becomes widespread enough, the elites may have to take a “step back” as we have predicted they might. Resistance is spreading. We can see this in Slovakia, where that Eastern European nation was the last holdout among euro-zone nations to approve the EU’s most recent sovereign bailout fund. On Tuesday, the parliament rejected the fund and brought down the government of Prime Minister Iveta Radicova. On Thursday, the parliament voted FOR it, but the point had been made. Slovakia’s cry of defiance has not been entirely pointless. Richard Sulik – the speaker of parliament – has caught a mood of popular disgust that goes far beyond his own country. His objections are unanswerable. How can there be any justification for a state of affairs where a poor but rule-abiding EMU state must bail out a serial violator with twice the per capita income, and triple the level of the pensions – a country which is in any case irretrievably bankrupt? How can it be that the no-bail clause of the Lisbon Treaty has been ripped up? But he also touched on the most neuralgic issue, reminding everybody that the EFSF is ‘mainly for saving foreign banks’. These are French, German, British, Dutch, and Belgian banks, of course … ‘I’d rather be a pariah in Brussels than have to feel ashamed before my children,’ Sulik said … Bravo. The colossal miscalculation made by Washington and Wall Street is that they could control the moral hazard genie once they removed it from the bottle. They believed they could use the genie to enrich themselves with trillions of dollars’ worth of taxpayer money, and then replace it in the bottle before its magic spell of immorality metastasized throughout society at large. They assumed that the people would be too stupid to see what was going on. And that even if the people did figure things out, they would willingly wear the thick, choking chains of debt being welded to their necks by the financial elite and its Washington enablers. Dougherty has written a REAL article of REAL observations about the end of Western civilization. Sheesh, … Spengler’s Decline of the West in three darn pages … He’s right, he has gotten the morality right. It’s not just the culture of the West, or its promotions, or even its social organization that is finished. The Internet Reformation is a process, not an episode. The experts at the world’s central banks are on the job. This Bloomberg article is just another in a long line of disappointing mainstream financial reports that does nothing to address the real issues causing the crisis and, in fact, does everything to try to misinform the public into believing that the “experts” have all under control. Well, we do not think more jaw-jaw is what people want to hear right now, or that the money magicians are capable of doing anything to stop the rapid erosion of public confidence. And based on the recent upward move in Honest Money, it is quite obvious the markets don’t want to hear it either. Regardless of what Bloomberg wants people to believe, the world’s central banks are NOT independent banks led by teams of “experts” dedicated to establishing prudent national monetary policy. No, they are nothing of the sort and never were intended to be. They are simply a cartel-like crime syndicate that operates under the direction of the Swiss-based “super central bank,” the Bank for International Settlements. And the BIS is just one more tool in the arsenal of elite monetary control of the world. The BIS sits like a great spider at the heart of the corrupt and ruinous central banking mechanism that the Anglo-American elite has successfully foisted upon the world. It coordinates the policies of these ruinous entities – not to any great effect – but to ensure that the Anglosphere maintains control of what it has built. The Western elite’s banking scheme is a central part of how the Anglosphere has managed to dominate the world behind the scenes. Through central banking and the BIS, the Anglo elites have a stranglehold over economies worldwide. Even though most of the world was aligned against a presumed to be corrupt BIS after World War II, it somehow managed to escape dissolution. This is because it is a prime asset of the City of London, that mysterious one-square mile patch of real estate at the heart of London where the Bank of England itself is located. However, today all of the elite’s poisonous machinations face an unprecedented decline in public confidence. And nowhere is the threat of total collapse more intense than on that most important elite edifice of all – the central banking system itself. It is only the confidence of the public that enables the continuous printing of unrestrained fiat currencies – which combine to provide the base of an international Ponzi scheme. But something’s happening around the world that the money masters didn’t plan on. People are waking up. The next day, the Frankfurt-based ECB, which last week restarted its bond-purchase program after an 18-week hiatus, extended its focus to include debt of Italy and Spain, the region’s third- and fourth-largest economies. The Fed’s decision Aug. 9 to hold its key interest rate at a record low through mid-2013 and signal it’s ready to use additional tools comes as U.S. politicians are tightening the nation’s fiscal belt and the economic stimulus enacted by President Barack Obama in 2009 comes to an end. Bank of England Governor Mervyn King told reporters in London yesterday that headwinds buffeting the nation’s economy are intensifying “by the day” and officials can expand stimulus if the outlook for growth deteriorates further. Bank of Japan Governor Masaaki Shirakawa said Aug. 9 that volatile exchange rates could have a “negative impact” on the economy, after the central bank last week added 10 trillion yen ($130 billion) of stimulus and the country unilaterally intervened in the currency market to weaken the yen. That’s it? The central banksters have decided to do MORE OF THE SAME. They’re all going to work to make sure they “print-in sync” as much new money as “necessary” so that none of them face total collapse and threaten to take down the entire game? That’s the plan? And they will directly intervene in the market to create the illusion of demand/strength by buying the garbage debt from countries like Spain and Italy? This is the plan? Isn’t that called market manipulation? Wow. Well, here’s a better plan. Stop the insanity! You cannot fix a dysfunctional monetary system that is built on a fraudulent premise by simply increasing the degree of the crime. The impossibly wealthy families who desire one-world governance will stop at nothing – including the use of force – to complete their centuries-long mission. But arrogantly, they will refuse to cease their devious efforts and instead will try to use these crises to bind the masses into accepting a fear-based international monetary solution. Out of chaos… order. Can’t you just see the smile on Christine Lagarde’s face as she gleefully embraces her new position as Head of the International Monetary Fund? For surely there is an IMF logo engraved on the international boot readying itself to slam down on the faces of current and future generations. But hold on a minute… will the puppets/experts running the world’s central banks – and Money Power standing behind them – be able to pull off this global manipulation? We’re not so sure they will. And we certainly don’t wish them luck. All across the world, the modern Internet Reformation is beginning to reshape the way people relate to power in the modern age. While it is not as obvious as during the era of the Gutenberg Press, there is formal doctrine accepted by Western societies that is beginning to shatter. That formal doctrine may be termed regulatory democracy and it has been leavened with numerous assumptions that on closer inspection turn out not to be true. Like what money is and what it is not. And it is the Internet itself that allows for information to spread that undermines the various precepts of regulatory democracy. It is this hierarchy that promulgates regulatory democracy and its various dominant social themes – the fear-based promotions that the Western power elite uses to control the conversation and to further centralize power and authority worldwide. And one of those fear-based promotions that the masses have been bombarded with is the “expert” theme. The public is constantly being promoted into accepting a passive position with respect to how the financial world operates. They are meant to be overwhelmed with facts and complicated economic formulas so they feel helpless, confused and generally incapable of mastering their own financial destinies. After all, how could anyone understand such a complex subject as money? Well, all around the world people are starting to understand that the system is rigged and money really isn’t complicated at all. The Internet Reformation reveals the cartel’s synchronized efforts to manipulate public confidence so they can continue their fraudulent and manipulative wealth redistribution game. The reality of the situation is this: there are no magic monetary tools that can fix the global monetary crises hidden in the basement of the Federal Reserve, the Bank of England, or any of the others. The fiat money instruments themselves – dollars, euros, yen, etc. – ARE THE PROBLEM. And in this alternative media-led ‘Net era, the old men hiding behind the central banking curtains are starting to look rather pathetic. The illusion is fading and people are waking up. In fact, the European Union is failing, various serial wars of conquest are not going well, and the fear-based memes of the elite are continually being debunked by an Internet that adds more to humankind’s real knowledge base every day. It will take decades if not centuries to control the damage that has already been done (from an elite standpoint), and what has been done cannot be undone. YES, THE US HAS SOME VERY REAL LONG-TERM ISSUES WITH SOCIAL SECURITY AND MEDICARE. Social Security is being strangled by the refusal to raise the income limit on the Social Security withholding tax in response to the gradual creep of inflation. If this limit was raised periodically the Social Security ‘problem’ would be resolved. Medicare and in particular the drug portions of the program added by the Bush II administration are driving costs much higher. And this is more of a problem because of the structural cost problems in US healthcare system. Big Pharma in the US is a powerful lobbying force, and Americans pay MUCH higher costs per benefit for their health care services. This is inhibiting the steps that are needed to restructure the US healthcare system. But Social Security and Medicare, without the drug program, have not substantially changed since the 1990’s, when the US was running a budget surplus, and then Fed Chairman Greenspan was reassuring the public that the Fed had a plan to deal with the lack of debt. The repeal of Glass-Steagall and the growth of unregulated financial products, the co-opting of the regulatory agencies, the growth of corporate influence in Washington, and two unfunded and very costly wars of long duration, founded largely on lies and distortions following a despicable terror attack by a small group of people, coupled with tax cuts for the wealthy. There is relatively little discussion, much less investigation, indictments and convictions, from one of the largest financial frauds in history. And within twelve months of the crisis breaking, Wall Street bonuses were back to record levels, even as the rest of the country began its long downward spiral into debt, downgrade, and despair. That is the long and short of it. And it bodes ill that these issues are so infrequently mentioned in the political and economic discussions circling Washington and New York today. Rational discussion and factual analysis has been overwhelmed by a well funded program of propaganda and sloganeering, and bought and paid for politicians and media which serve to direct the discussions according to the program of the monied interests. And this is why the outlook for the US is so negative. Governance has failed, the system has been thoroughly corrupted or co-opted, and the planning and discussions cannot gain traction. Some have recently referred to Obama’s clarity gap because it is so unclear what he stands for, what principles he is willing to fight for. The politicians of both parties, the media, and the business leadership are caught in a credibility trap in which the root causes cannot even be discussed, must less addressed, because they have all been involved in or benefited from a massive injustice in the financial frauds. They are complicit, and cannot act openly and honestly for fear of losing control of the debate, and of subsequent discovery. And who do we see on American television this morning, providing economic advice and promoting the Wall Street prescription for a cure through a return to more bank deregulation? The angel of economic death, Alan Greenspan, a man without shame or honor as one of the great authors of the misrepresentations and mismanagement that led US into the financial crisis which rewarded the few at the expense of the many. The real issue at the end of the day is reform. The US has been led down a dark alley and strangled in what history may recognize as a financial coup d’etat, and a campaign of economic war against the common people. The Banks must be restrained, and the financial system reformed, with balance restored to the economy, before there can be any sustained recovery.